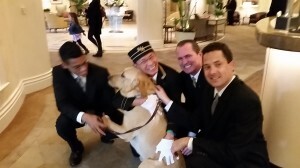 Travels with Journey to The Beverly Hills Hotel: 8 Paws and counting! What could be more classic than his own signature bowl! It’s the mecca for Hollywood’s elite, a home to stars and high society patrons, it remains one of the most iconic hotels in the world. Nothing can compare to its history or compete with its 12 lush acres of tropical gardens and exotic flowers… just ask Journey he’s been on the prowl. He’s a celebrity! They rolled out the red carpet to greet him. We just returned from Paris and London having stayed at Le Meurice, The Dorchester, 45 Park Lane and Coworth Park in Ascot… all properties part of the collection. Each hotel offers exceptional culinary choices but what brings the memories to life is the Tasting Menu served by the Beverly Hills Hotel. We sampled some of the best. But the Chocolate Souffle remains the crown jewel of deserts from the Polo Lounge. As part of the in room dining service we reminisced about our exquisite culinary experiences throughout the Dorchester Collection. From the moment we checked in… Journey got his treats! Our suite was magnificent. On the third floor and overlooking the palm-trees, a forest to be exact. Journey settled in comfortably on his favorite blanket, a Native American designed towel by Pendleton from Outpost Trading Company. Perfect for traveling with your pet. Over the past one hundred years, Hollywood stars have enjoyed the timeless glamour of this dramatically beautiful setting. Some left their marks (BC) Before Cells. Journey and I had a chance to linger by the palm-tree lined pool, complete with newly refurbished private cabanas. Breakfast was cooked to perfection poolside at the Cabana Café. Journey took time to warm our waitress’s feet. History abounds mixed with rumors but some say the one of the biggest splashes heard around Hollywood was Katharine Hepburn once dove fully clothed into the pool after a tennis game. Compared to today’s stars and their behavioral antics that seems rather dull. In the ‘60’s the Beatles were sneaked into the pool through a back way. Hernando Courtright, who ran the hotel in the 1930s and ’40s, is responsible for the hotel’s pink facade and striped awnings. Anecdote: For years Charlie Chaplin had a standing lunch reservation for booth 1. It remained empty if he didn’t show up. Both dedicated eco-friendly, green, sustainable lifestyle advocates and activists, James and Nancy Chuda have worked tirelessly to advance children's environmental health education and affect change for a safer, toxic-free and healthy environment. After losing their only child, Colette, at the age of five, to a rare non-genetic form of Wilm’s tumor, they founded Healthy Child Healthy World in 1991, one of the most respected national children’s charities whose purpose is to inspire parents to protect children against harmful chemicals. In Colette’s memory, they have mobilized parents and caregivers, environmental groups, the scientific community and media to work together to help make the necessary changes in national policies to protect our children. They currently serve as the Chairs on the Honorary Board of HCHW. Looking for an environmentally and socially friendly vacation?